The United Launch Alliance (ULA) have launched their Atlas V 501 carrying the X-37B OTV-2 spacecraft on Saturday, the second attempt following Friday’s scrub due to unacceptable weather at Cape Canaveral. The launch came at the start of the second available launch window, which opened at 5:46pm, due to work to to replace a valve on the vehicle’s interstage helium purge system earlier in the countdown. Like last year’s flight of OTV-1, this X-37B mission will perform classified experiments for the Rapid Capabilities Office of the US Air Force. Once its mission is complete it will land at Vandenberg Air Force Base in California; the duration of the flight has not been announced, however the X-37 can remain in orbit for up to 270 days per flight. Officially, the mission is designated X-37B OTV FLT-2, and is likely to be renamed with a USA designation, probably USA-226, upon reaching orbit. This is the second X-37B mission, following the first flight, USA-212, made by X-37B OTV-1 last year. The mission was launched on 22 April, and completed its seven month flight with a successful landing at Vandenberg on 3 December. The spacecraft is believed to have conducted technology development experiments, and was reportedly a complete success; the only known problem being the failure of one of the spacecraft’s tyres upon landing. OTV-2’s tyre pressure has been reduced in order to mitigate this. The X-37 was originally developed as part of a NASA programme, which was taken over by the Defense Advanced Research Projects Agency (DARPA) in 2004. 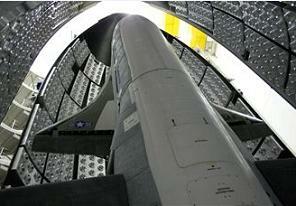 The X-37B military derivative began development in 2006, and made its first flight last year. The 5000-kilogram X-37B was built by Boeing, and measures 8.9 metres in length, with a wing span of 4.5 metres and a height of 2.9 metres. The spacecraft carries gallium arsenide solar arrays which will be used to provide power, and charge lithium ion batteries for use in the Earth’s shadow. A third X-37B mission, using the same spacecraft which was used for last year’s flight, is expected to be conducted at some point in the future, although details are vague. A second flight of the spacecraft being launched today is not currently believed to be planned, however the spacecraft is capable of being reused, and a mission could be scheduled if the programme proves successful and worthwhile. OTV-2 will be launched by United Launch Alliance. 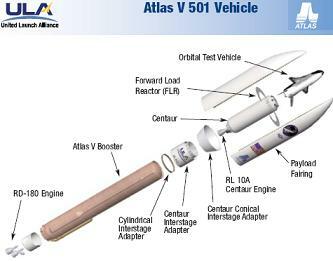 An Atlas V 501 rocket, with a five metre payload fairing, no solid rocket motors, and a single-engine Centaur upper stage, will be used to place it into orbit. The rocket being used for today’s launch has the tail number AV-026, and will be the twenty-fourth Atlas V to fly. The launch of AV-026 marks the seventh use of the five metre fairing, which is produced by Swiss company RUAG, who also produce the fairing for the Ariane 5 rocket. The fairing has an external diameter of 5.4 metres, and measures 20.7 metres long; the shortest of three configurations, with 23.4 metre and 26.5 metre fairings also available. AV-026 is a two stage rocket. Its first stage, a Common Core Booster, is powered by a single RD-180 engine which burns RP-1 propellant oxidised by liquid oxygen. The RD-180 will ignite 2.7 seconds before the scheduled launch time. At T+1.1 seconds, liftoff will occur, and AV-026 will begin its ascent. United Launch Alliance have not confirmed details of the mission profile, but assuming it follows the same timeline as the previous X-37 launch, AV-026 will perform a pitchover manoeuvre nineteen seconds after launch, establishing a zero-angle-of-attack flight profile around 33 seconds later. The next major flight event will be the separation of the payload fairing, expected around three minutes and 39 seconds after launch. Following separation, the fairing will fall into the Atlantic Ocean. It is not designed to be recovered, however part of the fairing from the previous X-37B launch survived its descent, and washed ashore in South Carolina. It has since gone on display at the Costal Discovery Museum in Hilton Head. Five seconds the fairing separates, the forward load reactor will follow suit. This is a device used to dampen vibrations within the fairing, and to provide additional rigidity to the top of the structure. About 265 seconds into flight, booster engine cutoff (BECO) will occur; the first stage engine shutting down having expended its fuel supply. About six seconds after BECO, the first stage will separate, and after a further ten seconds the second stage will ignite. The second stage of the Atlas V, the Centaur, is powered by one RL10A-4-2 engine, which burns liquid hydrogen propellant with liquid oxygen oxidiser. Assuming that a single-burn insertion is used, as on the previous mission, the Centaur’s first burn will last around twelve minutes and thirty seven seconds. The Centaur will then reorient itself, and deploy the X-37B. Once the X-37B has separated, the Centaur will probably make some form of disposal burn to distance itself from the X-37B; reducing the debris in that orbit, and making it more difficult for amateur observers to locate the X-37. On the previous X-37B launch, the Centaur was placed into a heliocentric orbit. The US Air Force are unlikely to disclose details of the X-37B’s orbit, however it is likely that amateur observers will be able locate and track it once it is in space. According to maps of the launch hazard area for today’s flight, the Atlas V will head east-southeast from Cape Canaveral, out over the Atlantic Ocean. On the previous X-37 flight, the rocket launched on a similar heading, and then performed a dogleg once it had left the launch hazard area, increasing orbital inclination to around 40 degrees. It is not known whether a similar manoeuvre will be performed on this flight. 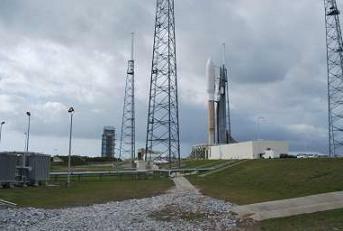 The launch of AV-026 will take place from Space Launch Complex 41 at Cape Canaveral. Built along with SLC-40 in the 1960s for use by Titan III rockets, SLC-41 was first used for a Titan IIIC launch in December 1965. Subsequently it was later used by the Titan IIIE rocket, which deployed the Helios, Viking and Voyager missions to study the Sun, Mars, and the outer planets. Titan IV launches were made from SLC-41 between June 1989 and April 1999. Six months after the last Titan IV launch from the complex the fixed and mobile towers at the pad were demolished in controlled explosions. The pad was subsequently converted for use by Atlas V rockets, with the maiden flight of the type being made from the complex a little less than three years later. Like other Atlas rockets launched from SLC-41, AV-026 was assembled in the Vertical Integration Facility, located about 550 metres southeast of the launch pad. The rocket was built atop a mobile launch platform, which was used to transport it to the launch pad. Rollout was conducted on Thursday, and the rocket spent around 40 minutes travelling to the launch pad; arriving at 19:30 UTC. This is the first Atlas V and second EELV to launch this year. The next Atlas V launch is currently expected to occur on 12 April, and will perform the NROL-34 mission, deploying a classified satellite for the US National Reconnaissance Office (NRO). The next EELV launch will be of a Delta IV Medium+(4,2), also carrying an NRO payload, NROL-27, on 11 March.